The Pro bars (above average trade size) on the 4,500 tick chart will really show you the way. Today they sold the Open and then re-shorted when we tested the Opening high. The downside move wasn’t over until the Pros stepped in again to take profits at 12:30pm. On the image below the Professionals are shown with blue bars, using the Better Pro Am indicator. At the Open (vertical yellow dotted line), the Professionals are anxious to Short it and their large sell orders drive the Emini down. Then when we re-test the Opening High, the Professional sell orders are triggered as the Emini comes back up – so they’re Shorting on up bars. 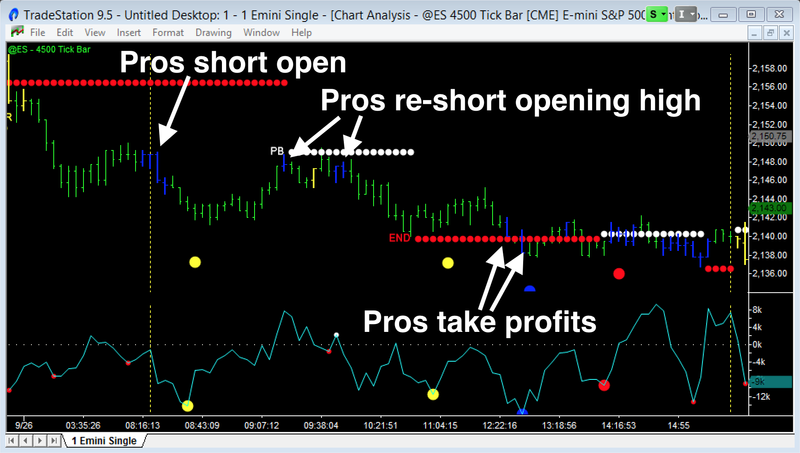 Then the opposite happens when the Emini sells off and approaches the Professional profit taking levels – so they’re Closing out their Shorts on down bars.